While my trip to Beijing was for business, we arrived on a Sunday and forced ourselves to stay up to better adapt to the time change. That resulted in a rather quick tour of some of the more common locations for tourism, including a "Hutong" more preserved for tourism than anything. 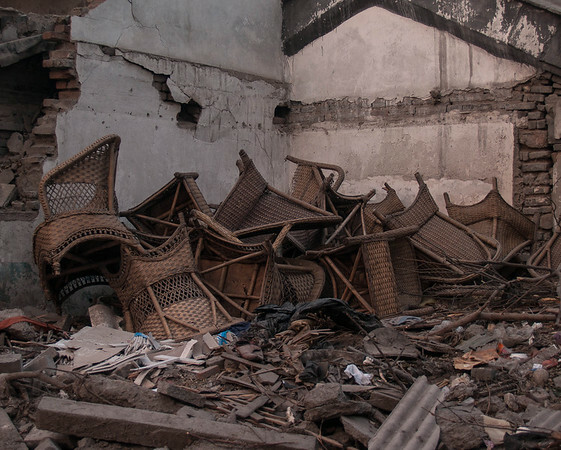 While most of the photographs I took didn't interest me later, I was struck by this collection of wicker chairs in the lot of a building that had been torn down. The original image has two satelite dishes in the upper left on top of the roof of the building still standing in the next lot. While the contrast was interesting, I ultimately thought the composition was stronger when the photograph was cropped.